A long time ago, I posted about Michael Vick. For those outside the sporting world who need a review, Vick was the one-time most exciting player in the NFL. The number 1 overall draft pick from Virginia Tech in the 2001 draft, Vick played for the Atlanta Falcons for six seasons before being arrested for and convicted of running an illegal dogfighting operation. He served 21 months in federal prison before declaring bankruptcy, being cut by the Falcons and sued for repayment of salary, and finally being signed by the Philadelphia Eagles in 2009. Eagles owner Jeff Lurie said when he was thinking about signing Vick that we "needed to see some real self-hatred" for what he had done. Eagles fans protested outside the stadium, wanting nothing to do with Vick. An athletic quarterback known more for what he could with his legs than with his arm, Vick was roundly dismissed by sports pundits. It was assumed that, older now, his legs would betray him, leaving him to rely on passing skills that he never really had in the first place. The pundits, apparently, were wrong. Through three weeks of the 2010 NFL season, Michael Vick has been called, by the Washington Post's Michael Wilbon, a well-respected NFL commentator, the season's most valuable player so far. Steve Young, one of the all-time great quarterbacks to play the game, says he is "electrified" by the way Vick is playing and his potential for the season. Vick trails only Peyton Manning in passer rating, the cumulative statistic for judging quarterbacks. He has thrown six touchdown passes and no interceptions. As ESPN's Tim Keown says, though, "It would have been quite a bit easier had Michael Vick returned from prison and remained a mediocre backup." What Keown is getting at is the conundrum that Vick has placed us in with his performance. In his article, Keown questions the validity of the "redemption story" tag that gets thrown at Vick. He cautions us not to think of this as more than a great football story. If you listen to sports talk, on radio or TV, you can hear the tide turning in Vick's favor. The fans who once picketed Lincoln Financial Field (where the Eagles play), now hold "Vickadelphia" signs. But is this redemption? Keown says no. He says that we (Americans) love to say that "we're the land of second chances" and that "we're a forgiving nation" but accurately notes that "we do intolerance and rigidity when it fits our purpose." Keown argues that this situation feels redemptive to us because Vick is playing so well. "We're a country that values winners over the redeemed. The redemption we're seeking is often just the excuse to feel good about rooting for someone whose past is thoroughly distasteful." So where does that leave us with Vick? While his career may be being redeemed, what about Vick himself? In this article from The Baptist Press, Art Stricklin details Vick's first adult public confession of faith in Jesus Christ. At the annual Super Bowl Breakfast hosted by Athletes in Action and Campus Crusade for Christ, Vick joined more "public" Christians Tony Dungy and Kurt Warner on the dais. Warner was there to receive the AIA Bart Starr Award, annually given to the player who exhibits character and leadership on and off the field, an award Michael Vick will never be considered for, let alone receive. Vick described becoming a Christian in high school, but said that "the more success he achieved on the football field, the less he needed God." He said, of his time of incarceration, "I got back to my roots. The only thing I could do in prison was fall back on God. I wanted to do things right, that I didn't do the first time." This is a typical story: the disgraced celebrity who finds Christ in the joint. But why does it rub us the wrong way? We prefer American redemption, the kind that Vick is enjoying on the field. We like success stories: people who play well. We want winners. As for God's redemption, we wish that our disgraced athletes would talk about their faith and reliance on Christ before they get disgraced, when it seems like they're just doing it as a P.R. ploy. Just as in American redemption, we prefer winners: people who live their lives well. 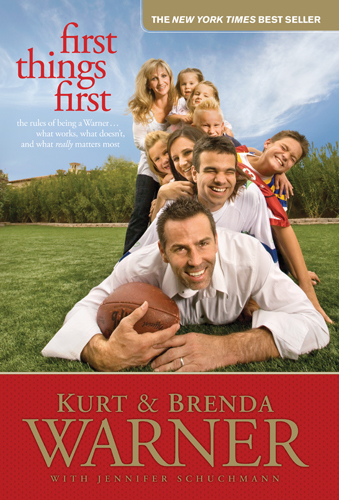 We prefer Kurt Warner and Tony Dungy to Michael Vick. But aren't we Michael Vick? Isn't it when we're desperate that we become serious about our faith? When life is treating us well, we don't talk about our reliance on Christ. It is when we are disgraced that we fall back on God...just like Michael Vick. In our strength, we have no need of him. Michael Vick's American redemption is a redemption story on two fronts: a wonderful football player who seems to be playing wonderfully again; a longtime Christian who seems to have rediscovered his profound need for a savior. These are redemptions we can get behind. Maybe some attention will be taken from Vick's American redemption and given to his Christian one.